Have you ever had a rough day? You’ve likely walked past the botanical gardens on campus or at least seen them from a distance, if not taken a stroll through the greenery. Maybe you’ve had a cry during finals or a phone call to mom and dad in the gardens. Or maybe you’ve enjoyed a little morning yoga on the weekends. Little did you know that the botanical gardens at UH Hilo have a full and flush history behind them. 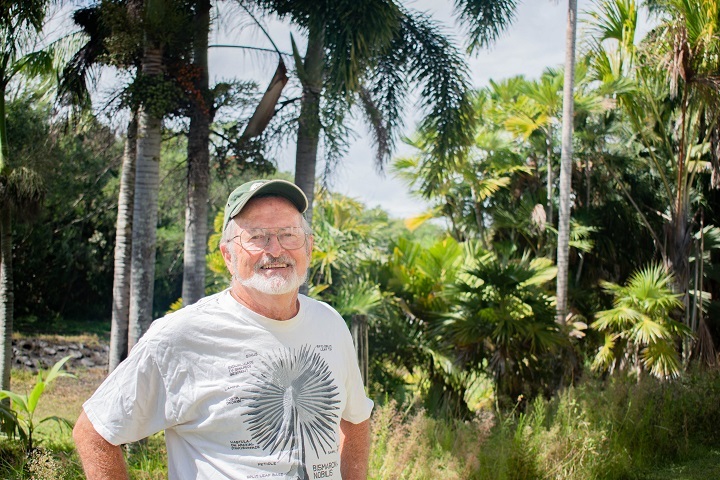 Don Hemmes, a professor emeritus of biology and one of the original planters of the gardens, explains that the gardens have three sections in total: what Hemmes calls “the shade house,” a landscaping garden, and the palm gardens along the dry river canal that runs through campus. Hemmes consistently weeds the area himself. “I started around 1990, almost 30 years ago. When I first came here, it was to teach botany. I was teaching the life cycle of a pine tree, and one of the students in my class raised her hand and said, ‘What’s a pine tree?’ She had never seen one, so I planted the first pine trees over here, and it just got out of control,” Hemmes shared. In addition to the general upkeep and weeding, Hemmes manages to make new seed. “The plants are all separate sexes. There are male and female, so I always try to get ahold of three and cross my fingers that I’ve got a male and a female in order to make some seed. I have some males and females of this very rare species, and I’m pollinating them so that I give the seed away to nurseries,” clarified Hemmes. Hemmes said that because many students in Hawai`i have not traveled to other places, he tries to fill the garden with international species. “A lot of these plants grow in South America; others grow in Africa or Australia. The students had commented many times to me that the most valuable part was to actually see the plant we were talking about. You can look at a picture in a book, but it’s nothing like actually seeing it,” Hemmes said. One special quality the botanical gardens hold is its cycads. “There are ten different genera here, and we have one of the largest collections on display, certainly in Hawai`i. The other big one is in Foster Botanical Gardens in Honolulu. I have probably about 100 species now. I haven’t counted them; I should do that and write it down,” Hemmes said. Cycads can also be found in other locations around Hilo. “In Lili`uokalani Park and Gardens, they have a nice collection of sago palms. When there was so much thievery happening, the state legislature made a law and put an artificial value of $2,000 on every plant. So if you steal it, that’s a felony. It’s like robbing a bank,” Hemmes stated.